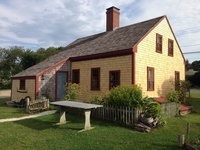 The Nickerson Family Association, 1107 Orleans Road, Chatham, Mass., is devoted to the Nickerson family name and the descendants of William and Anne (Busby) Nickerson and sponsors the Caleb Nickerson Homestead. The ''Caleb House'' is a classic Cape built c. 1829 and moved to the NFA campus in 2004. Craftsmen demonstrate forgotten arts such as open hearth cooking, beehive oven baking, heirloom gardening, Colonial woodworking and the fiber arts throughout the year. Tour our house, period kitchen gardens and post & beam outhouse on Wednesdays and Saturdays in season from 10:00 a.m. to 2:00 p.m. The primary goal of the NFA is to research and preserve Nickerson genealogical information. The Nickerson Genealogical Research Center, located in Chatham, maintains an extensive, growing collection of Nickerson records and memorabilia, based on over 100 years of research, as well as a large library of Cape Cod history and genealogy.